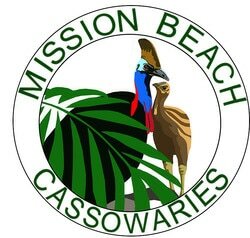 A male cassowary and it's two chicks died as a result of being caught in a pig trap at Mission Beach on the 15th Dec 2010. By the time the birds were discovered the adult had self inflicted horrific head injuries in a desperate attempt to escape. 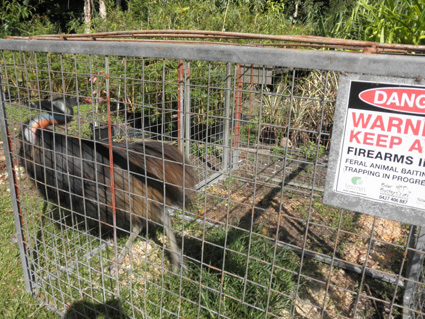 The two chicks, taken into care at the Garners Beach Cassowary rehabilitation centre subsequently died as a result of stress and dehydration. The trap had been set during the day and wire used as the trigger mechanism, both actions being against the recommended guidelines for the use of pig traps in the Wet Tropics. There were several concerns from individuals covered in the Seven News report. It is worrying that a subsequent article in the Weekend Advocate promoted the pig control program when there are serious questions being asked about the management of the program ahead of a review of the present guidelines. The tradegy of the incident is the denial now of further study of perhaps unique parenting behaviour where the female continued to raise one of the chicks of the family unit.